Farms are disappearing and being consolidated quicker than ever today. The reasons why are not difficult to understand. Between the low margin of profit that often accompanies farming small acreage and the rising price of agricultural land sold to urban developers, many small farms are being assimilated into larger farms or merely disappearing. According to the USDA Statistics Service (2009), from 1970 to 2007, Ohio lost over 36,000 farms and 3.3 million acres of farmland. With Ohio losing nearly 32% of its farms and 19% of its farmland, many farmsteads are becoming merely houses with barns next to them. Moreover, since Ohio has the 6th largest number of barns built before 1960 (USDA Ag Census, 2007), that leaves a lot of old barns, like the raised three bay threshing barn shown in Figure 1, without a job. Figure 1: Raised basement three bay threshing barn near Alliance, Ohio. When something no longer has a purpose, or is no longer effective at fulfilling its purpose, it tends to be forgotten because it no longer warrants our time and energy. Since our older timber framed barns cannot usually accommodate the massive size of either today's equipment or today's herds, it is often their fate to pass out of mind and into ruin. However, this is not where they have to stay. There are as many reasons to rehabilitate and restore an old barn as there are barns that have fallen into disrepair. In general, there are four major reasons to choose rehabilitation over demolition and/or new construction: (1) historic preservation, (2) longevity, (3) versatility, and (4) economics. These barns represent our agricultural heritage, and are built of irreplaceable materials and craftsmanship from our own past. From the virgin timbers that frame them, to the hand quarried stone that is their foundation, the blood and sweat that our forefathers poured into their futures built Ohio's present. These barns were made in a time when there was no planned obsolescence or limited lifespan; they were designed to be as strong as possible and to last as long as they could. They are the legacy left us by our forebears, and to care for them, respect them, and appreciate them shows their builders the respect they deserve and strengthens our own heritage. It is our responsibility and our privilege to be good stewards of these structures so that they can be enjoyed by future generations, for too few have such beautiful and direct links to their own past. Another advantage to restoring an old timber frame barn is the building's lifespan. Some European timber frame barns are hundreds of years old, and American barn builders took the European designs and improved them. If cared for properly, an American timber frame will last hundreds of years longer than its European counterparts. Although there were no pole barns being built one hundred years ago, it would most likely be the consensus that even the newly constructed ones will not be here in fifty years, let alone one hundred. There is a vast disparity in long-term durability between building a free-standing frame on top of stone or masonry foundations (timber frame) versus cementing wood posts into the ground and using them as the upright members of the frame (pole barn). The intrinsically higher moisture content in the supporting posts of a pole barn leads to a severely reduced lifespan of those structures. "The key to saving old barns is to adapt the structure to the needs of the current owner while maintaining the character of the original structure." Figure 2: Dean Genter's rehabilitated barn with new attached side shed. Archbold, Ohio. There are numerous examples of traditional timber frame barns that, no longer able to serve in their original role, have been retrofitted to serve a new one, thus extending the useful life of the barn. This can include installing new equipment, removing equipment, or modifications to the structure itself to prepare it for its new role on the farm. If the barn is still in good structural shape, this is often vastly cheaper than demolition and construction of a new barn. An excellent example is the rehabilitation of Dean Genter Farmstead in Archbold, Ohio. Mr. Genter's barn was built in 1892 for $960, including the slate roof. Designed originally as a horse and dairy barn, it was no longer big enough nor applicable to current production needs. Mr. Genter successfully converted it to a modern hog-finishing barn with an automatic feed system, which can be seen in Figure 2. 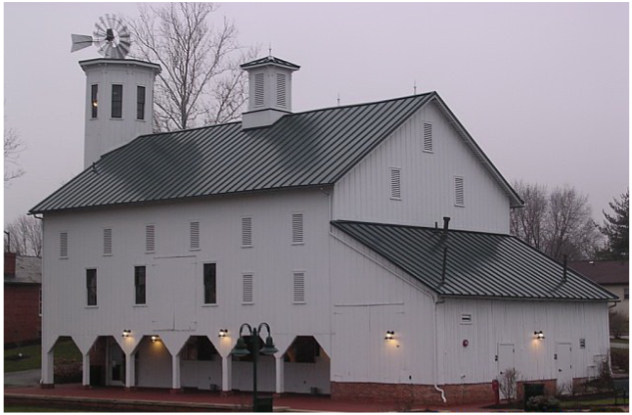 Another example of an old barn that has been adapted for modern use is perhaps the most famous barn in Ohio: the J. H Manchester Barn in Lakeview (see Figure 3). Built in 1908 by Horace Duncan for the Manchester family's Maple Avenue Farm and still in use five generations later, it has been featured in many magazines including Time, and is considered such an excellent example of traditional round barns that it was chosen to be one of only 17 modeled by Ertl for their American Country Barn Series. Originally used for livestock housing and feeding, the Manchester Barn was restored over 15 years in the 1970s and 1980s to be used for soybean storage and has recently had yet another facelift. After over 90 years as a white barn, it is now traditional barn red. Figure 3: The Manchester Round Barn, which had been white for many years, seen here in its new coat of classic barn red paint. Lakeview, Ohio. While many of the timber framed barns that are rehabilitated are still used for farming, even if the current use is no longer the original one, this does not have to be the case. There are innumerable examples of barns that have been restored and converted into commercial or even residential properties. For a more in-depth look at non-agricultural uses of barns, please visit the University of Wisconsin-Extension's Barn Preservation website and view the "Wisconsin Barn Adaptive Re-use Summaries" document at: uwex.edu/barns/pdf/adaptive.pdf. There are many advantages to rehabilitating a barn for commercial use, even beyond the agricultural uses mentioned above. The restoration or adaptation of an old barn can often provide a low cost start up for many a new enterprise. In the case of non-agricultural uses of older barns, there can also be several beneficial side effects. Traditional barns overflow with character, they are easy to recognize, and most importantly, they are something different. This trait makes them both easy to remember and a curiosity to be explored. These barns remind us of the past—whether it is our own or one we simply hold in our hearts as a simpler time—which can often work to the advantage of one's business plan. This is not to say, however, that there are no obstacles that need to be dealt with. When converting a barn from agricultural use to commercial human use, one must be extra wary to maintain the barn's character and charm, while overcoming the inherent challenges that often accompany a barn conversion project. For instance, one might have to remove residual odors leftover from animals, machinery, or anything else that was previously housed within the barn. Similarly, one needs to determine if any potentially harmful chemicals were improperly stored or used to treat the wood. Finally, with a different use comes different building codes that need to be met before the structure can be approved to be open to the public. An excellent example of a farm being restored for use as a public meeting and social gathering place is the Everal farm and homestead in Westerville, Ohio (see Figure 4). The barn was named Rosedale after J.W. Everal's rose garden, and constructed in the 1870s with the brick foundation and tile roofing formed from clay mined less than a mile away and fired in Everal's own tile company kiln. The tile company closed in 1912 with the depletion of the local clay resources, and as time wore on, the barn passed through the hands of several different owners. In 1973, the City of Westerville's Historical Society applied for it to be named a national historic site and was granted that designation in 1975. By 1978, the entire homestead and surrounding area was owned by the City of Westerville and fully restored by 1998 through historic preservation grants. Today, the Everal Barn and Homestead is rented out for events, parties, weddings, receptions, family reunions, and corporate outings by the Parks and Recreation Department of Westerville. The Everal barn, while not being used for agricultural means, is still fairly close to its original open interior style. A good example of a barn whose interior has been significantly altered is The Barn Restaurant in Smithville, Ohio (see Figure 5). The current barn was constructed in 1973 after a fire destroyed the farm's original barn. In August 1982, the barn started its transformation from food production to food service. For the renovation of the barn, some new rooms were needed, and to maintain a cohesive appearance, beams, a corn crib, and even an entire wall were taken from another barn less than a mile away. With the addition of an industrial kitchen and all the necessary furniture, the new restaurant was able to open for business by the summer of 1983. Figure 4: The Everal Barn in Westerville, Ohio. Figure 5: The Barn Restaurant in Smithville, Ohio, is popular with tourists and locals alike. The final, and perhaps most practical, reason to rehabilitate an old barn is financial. In many cases it is not only feasible to return these buildings to their former glory, but even financially beneficial. There have been many situations where barn rehabilitation was comparable in price and often cheaper than tearing down the old structure and building a new one. In fact, according to the case studies included in the Barn Again! publication, A Guide to the Rehabilitation of Older Farm Buildings, on average the savings of rehabilitation over new construction was more than twice the actual cost of the rehabilitation. A cost estimation fact sheet was published by the University of Wisconsin-Extension (Law, 1998), and while it was published over ten years ago, is an excellent resource of what costs need to be considered for an estimate to be accurate. It can be found at their website at lgc.uwex.edu/barns/pdf/costs.pdf. Beyond the simple matter of construction cost comparisons, there are more financial benefits to repairing an existing building on one's property over new construction, most notably tax incentives, property taxes, and insurance rates. The next fact sheet in this series covers in detail the tax incentives that are available for rehabilitating old barns, as well as guiding you through the process of applying for them; therefore, taxes will not be covered here. As for property taxes and insurance rates, in most cases a new building is considered to add value to the property. However, if the rehabilitated building stays within the original footprint, it is usually not considered a significant enough change to warrant re-appraisal of the building or property. This can allow you to maintain your current property tax and insurance rates for a building that is not only more useful and more valuable, but one that is of better quality than its newly constructed counterpart. Moreover, when rehabilitating or renovating an existing barn, it is often even possible to do so while at least part of the original building is still in use. This not only enables the continued use of the building, but also allows for the project to be completed over a longer period of time, thus distributing the cost over more time as well. There are clearly many reasons to rehabilitate an old barn rather than neglecting it or worse, tearing it down. It is a rare thing indeed when we are offered a choice that is both economical and has an opportunity to preserve such strong links to our past and insights into our own agricultural heritage. Moreover, with a little research and access to the right documentation, this choice can be much easier than many would think and still be less expensive than demolition and new construction. With so many benefits, shouldn't you consider saving your old barn?